Pedro is an eleven week old male puppy. 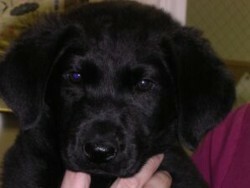 He is a lab/spaniel mix who came from the litter called the three amigos. 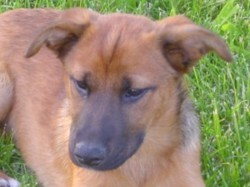 He is a sweet dog, quiet, crate trained, playful with other dogs and just a great puppy. Very calm and easily pacified, he should make a nice dog for a family or someone who has a flexible work schedule. He LOVES the water. 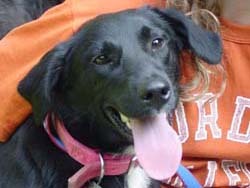 Sparkle is a Lab/Border Collie mix who looks like a lab with white toes. She weighs 33lbs and has an excellent temperament. Shade weighs 43 lbs and has an excellent temperament! He is young, 9 months, pretty much full grown, and full of fun. He loves ball, loves the water, loves other dogs, and loves to smile. 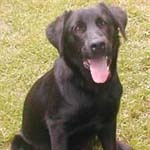 Moon is a 6 month old Lab Retriever who showed up in a rescuer's back yard (probably dropped off). They heard her rustling through the garbage in the moonlight so they called her Moon. She is a sweet dog and gets along with everybody. This puppy is one of a litter of three that were brought to a shelter in KY. We believe they will be small to medium sized dogs when fully grown. 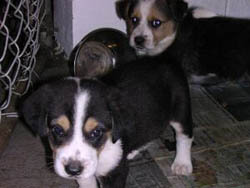 They are active puppies who have a good time romping and running. Ralph has a tan coat that has some brown highlights. His feathered ears and worried look on his face make a charming picture. These pups are just 8 weeks old. The mom looks like a small black beagle so possibly some lab, but she was only 30 lbs. so these may be small to medium sized. 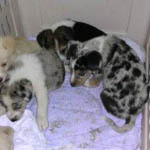 Two of the puppies are blue merle like an Australian Shepherd and four have blue eyes so Dad was most likely that breed. The tricolored ones we first thought were beagles, but they have the large white colors like the collie breed, so we think mostly collie. 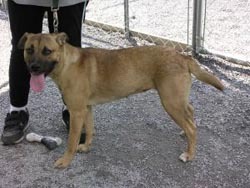 Macee is a pretty young lady who was dumped out with her 3 pups. 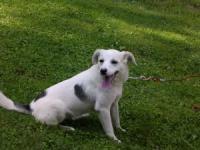 She is a shy submissive girl but very sweet and will come to you with tail wagging. She's only between 1 and 2 yrs old and only weighs about 30 lbs. She's good with other dogs and likes to go for walks. We're guessing on the breed since we really don't know what she is, except that she is very sweet and quiet. 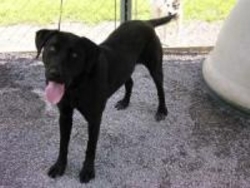 Midnight is a super sweet little black lab mix that is approx. 10 weeks old. Very friendly and playful. 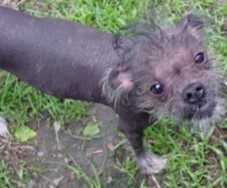 Myster is a nine month old Japanese Chin - Chinese Crested mix. His father is Diddy, also on our web site and mom was a purebred Japanese Chin. Myster is very friendly and outgoing, and extremely active and playful. He is in constant motion, hence the blurry pictures. You can see him leap-frogging over his dad in one of the pictures. He was not crated and raises a fuss for a good while in the crate, so someone who can house train him with lots of short walks would be great. He's eager to learn so should be a quick study. We're working on his leash skills as we speak. His skin will need TLC as it is extremely dry. Rosie is a Shepherd/Hound mix approx. 4 months old, one of a litter of 3. They should be around 50 lbs when fully grown. They are all a little bit shy, but starting to perk up now. All are working on crate training. They should be easy to train since they always follow their foster Mom around and are attentive. Rosie She has a lovely reddish coat. She is the shyest of the three, but is really coming around. She is learning how nice it can be to be petted and get love. She loves to romp and play with her siblings. She just needs some love and attention to really blossom. Please consider adding this cute girl to your home. Ruby has a reddish undercoat with a dark brown top coat. She is a lovely gal. She is ready to offer her love if you will give her a home. 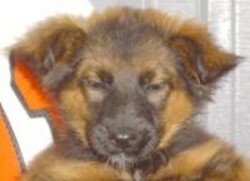 She i sone of a litter of three; Her brother, Ralph is also available on our website They are about 14 weeks old. We are guessing they have some Shepherd and Sheltie or Australian Shepherd. We believe they will be medium sized dogs when fully grown. 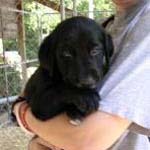 They are active puppies who have a good time romping and running. They have only been with us a couple days and are still settling in. They are a little shy right now, but should come out of their shell quickly. They just need some love and socialization. Colby was adopted from our friends at the Medfield Animal Shelter. He was an owner surrender when his elderly owner couldn't take care of him. Perfect example of a sweet, small pup that turned into a big dog. He is 10 months old and very friendly but could definitely benefit from obedience training. He shows no aggression at all with the other dogs but will be further evaluated in his foster home. He weighs approx. 60 lbs. 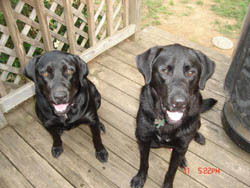 Dirk & Gracie are a female and male young labs are are looking for a new home as their owner is in the Air Force and had to transfer. They are wonderful dogs. They both are fixed, crate trained, and house broken. If at all possible we would love to keep them together. They love each other so much, and they play well. They love kids and the outdoors. They would take them hiking and camping all the time. Max arrives this weekend and will be available for adoption after 7/18/06. Max is a really sweet dog. He's pretty calm and is good on leash. He's gentle and would probably be fine with kids. He's good with other dogs and is quiet in his crate and seems house trained. Paco is an 11 week old male and is part of the litter called the Three Amigos. He is adorable, loves the water, and is very good in his crate. Patches is a beautiful little girl that is approx. 8 months old. She is about 25 lbs. and friendly but a little shy since she is new to the pound. She has a docked tail and a longer coat than a beagle so we're not sure what the mix is but she's very pretty. She will be evaluated with other dogs. Please see our puppy adoption requirements before applying. 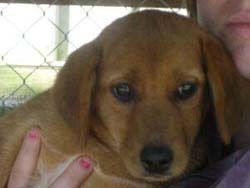 Roxanne is an 8 mo old female mixed breed who seems to have some beagle and some lab. She is quiet as a mouse, though, and sweet as can be. She is great with other dogs. Ruby is a sweet little girl. She is aprox. 8 months old and weighs about 25 lbs. 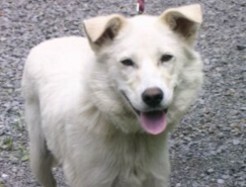 She is friendly and will be evaluated with other dogs. Please read our puppy adoption requirements before applying. Thank you! 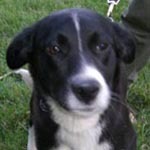 Spud is a young border collie mix who is very friendly. He has good energy and would be a great family dog if you have teens or older kids. He loves the water too. He's about 9 months old, already neutered and up to date on vaccines. He is crate trained and quiet in his crate, no accidents. He loves other dogs and is just a great dog. Come meet him! 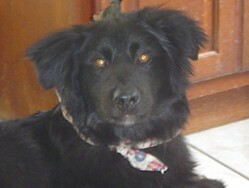 Teddy is a Border Collie/Spaniel mix and is about 9 or 10 months old (as of 6/25). 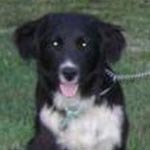 He is a nice looking dog with a black wavy coat and white chest. He weighs about 45 lbs. He is EXTREMELY gentle for his age. He doesn't jump up, takes treats gently, doesn't mouth you, plays nice with the puppies, is quiet in his crate and seems house trained. He is great with other dogs and is playful and submissive. He loves to chase a ball, but has no interest in squirrels or birds, which is great. We've never seen a border collie so calm and gentle. He is learning to walk on the leash and really enjoys his walks. He doesn't pull on leash and walks right along with you, with some criss-crossing in front so will need some work on heel, but he is really eager to learn. He is really a dream dog. Teddy has tons of potential and is just waiting for the right person to love him. Teddy is in foster care, so fill out an application to meet him. 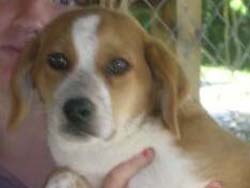 Toby is a very sweet beagle mix boy who is quiet and very friendly with people and dogs. 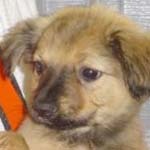 Wendy is an adorable sheltie/pug mix. Frankly, we can't understand why she's still with us. Her picture does not do her justice, and she's as sweet as can be. She came in with her 2 siblings. We believe she will be small to medium sized when grown. 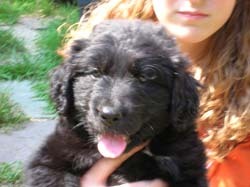 She's an active puppy who enjoys romping and running. She is approx 18 weeks old (as of 7/10). Wendy is ready to snuggle her way into your heart and home. Justine is approx. 1 yr. old and weighs about 35 lbs. She's not very big at all and is probably about as big as she'll get. She is super sweet and easy to walk on a lead. Not a hyper dog and loves to be petted. 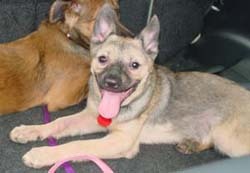 Justine is great with other dogs and loves to play, play, play. Spayed 6/28/06 and ready for her forever home. Justine will be available for adoption after 7/18/06. She loves to play with her foster family's Lab and English Setter. She enjoys being brushed and will follow some basic commands; sit, come and stay. Lady Jumper has been wormed, vaccinated and was spayed on May 23rd. She is a delightful pet and so loving. The vet has indicated that she is less than 2 years old. 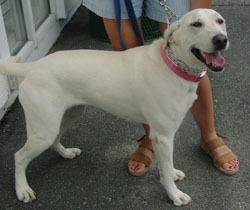 Mia is a female yellow lab who was turned in by her owner. She will be two in August. 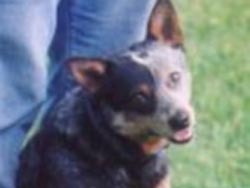 She is a friendly dog who was raised with children. She would need a fenced yard to play in as she has Lab energy. She could go with other dogs, but preferably males and preferably not small dogs as she likes to be the top dog when playing. She is spayed and up to date on vaccines and microchipped. 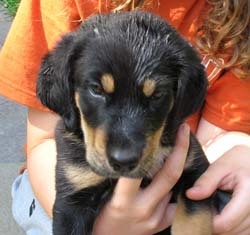 Pablo is a black and tan Lab/Spaniel mix who is part of the litter called the three amigos. He is a calm puppy, good in his crate, very quiet, and loves the water. Please read our puppy adoption requirements before applying. Thank you! All have adoptions in progress or have been adopted, except Blazer, the black and white male. See separate description. This darling is Scamp. She is part of a litter of 4 puppies that came in as strays. They are about 12 weeks old now (as of 6/1). Our best guess on their breed mix is Sheltie or Collie mixed with Shepherd. They should grow to be between 40 and 50 lbs. They are all a bit shy with people since they haven't had much socialization. You can tell they want attention, just unsure about people and new situations. With some socialization, love and care, these puppies will come out of their shells. They will grow to be devoted and loving friends. Like most puppies, they are active and very playful. They enjoy romping and chasing each other. 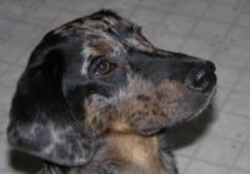 Scamp is very, very cute. . Scamp will be lots of fun and will charm you.